Knife River Indian Villages National Historical Site is located adjacent to Knife River close to its junction with the Missouri River in central North Dakota. 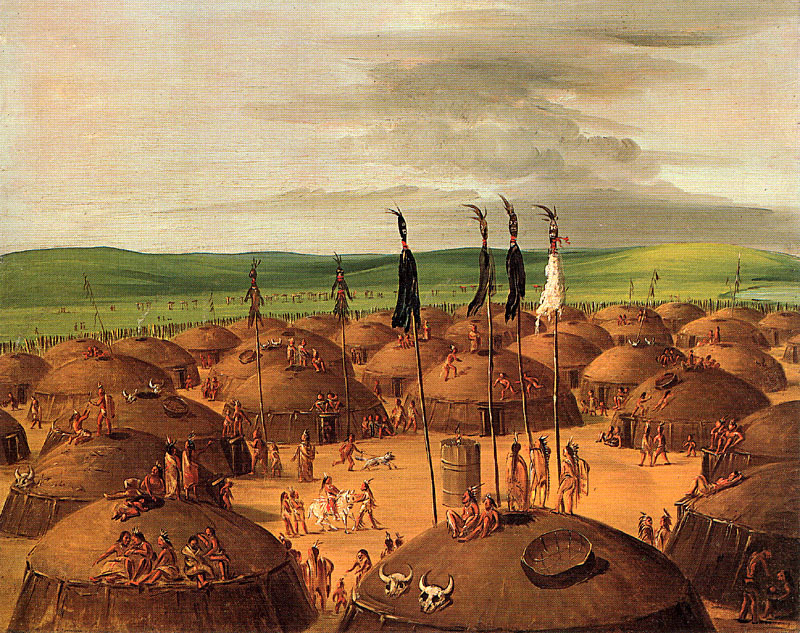 These Hidatsa and nearby Mandan villages were settled beginning around A.D. 1300. Five hundred years later, they figured prominently in the Corps of Discovery, which spent the winter of 1804-05 close by at Fort Mandan. Sakakawea (Sacagawea) and her husband Charbonneau came from the Awatixa Hidatsa village. 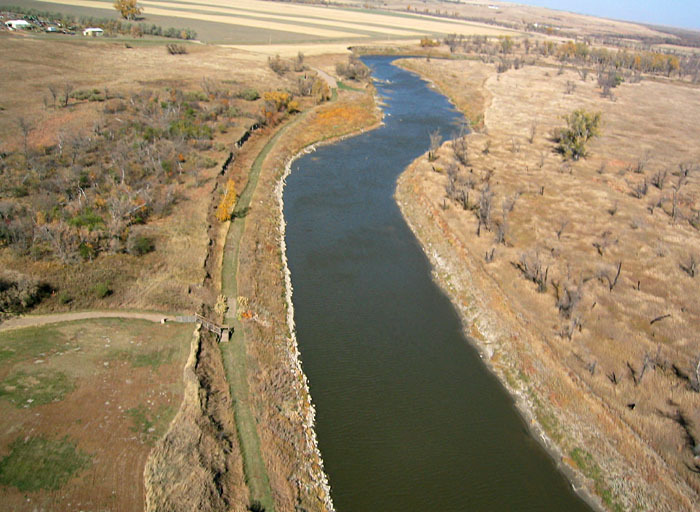 The presence of Sakakawea and her son with the Corps proved crucial for peaceful reception during the later journey, as no Indian war party travelled with women and children. Dec. 7, 1804: Capt. Lewis took 15 men & went out join the Indians, who were at the time he got up, Killing the Buffalow on Horseback with arrows which they done with great dexterity ... The Thermometer Stood this morning at 1 d. below 0. three men frost bit badly to day. Jan. 10, 1805: last night was excessively Cold the Murkery this morning Stood at 40°. below 0 which is 72°. below the freesing point. In spite of extremely cold temperature, the Corps spent a largely peaceful and rewarding interval in this locale. They accompanied Indians on buffalo hunts, made and repaired equipment, pursued Indian-U.S. diplomacy, and remained active throughout the winter. They would experience quite different conditions during the winter at Fort Clatsop on the Pacific coast the next year. 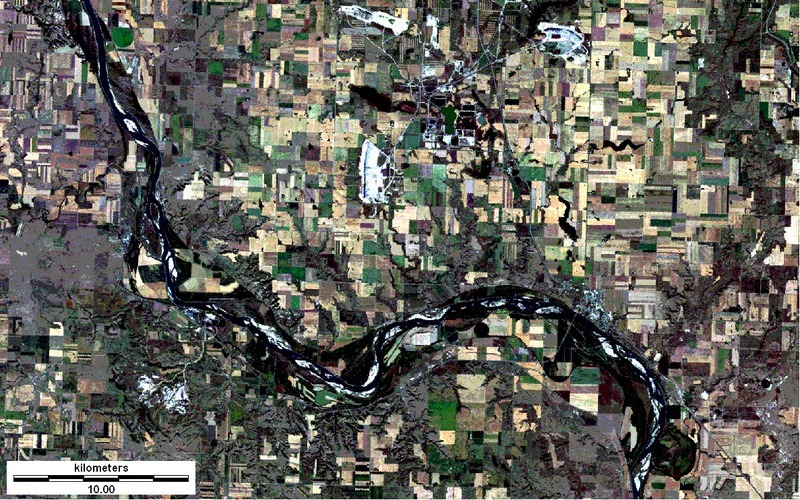 The following composite images portray the Missouri River valley in central North Dakota. Features of interest are annotated on the first image. 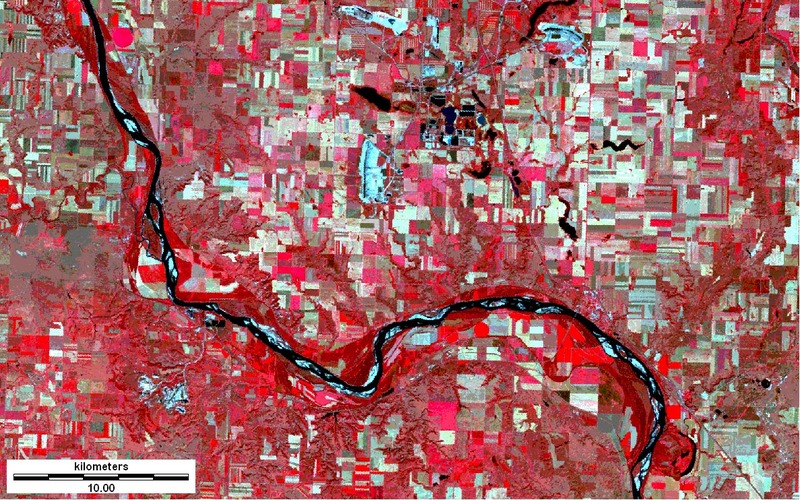 All images correspond to the same ground area and were derived from the same Landsat TM dataset acquired in late summer (15 Sept. 2000). Landsat TM 257 special false-color composite. This image includes visible and mid-infrared bands in a combination that creates a naturalistic view of the landscape. Active vegetation appears in green and yellow-green colors. Bare and fallow ground is tan to white, and water bodies are black. 1 - Lewis and Clark National Historic Trail--reconstructed Fort Mandan replica, 2 - Fort Clark State Historical Site, 3 - approximate location of original Fort Mandan (based on Ronda 1984, p. 68), 4 - Knife River Indian Villages NHS. 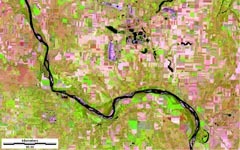 Landsat TM 123 natural-color composite. This composite consists of blue, green, and red bands depicted in a fashion similar to normal vision. Active vegetation is green and olive colors. Fallow fields, bare ground and coal mines are light tan to white. Water bodies are black. This image has high contrast and is relatively dark compared to the previous example. Landsat TM 234 standard false-color composite. This combination includes visible and near-infrared bands in a manner that resemble color-infrared photographs. Active vegetation appears in bright pink and red colors. Such images have long been used for camouflage detection, as only natural vegetation shows red and pink. Landsat TM 345 special false-color composite. This image incorporates one band each of visible, near-infrared and mid-infrared radiation. 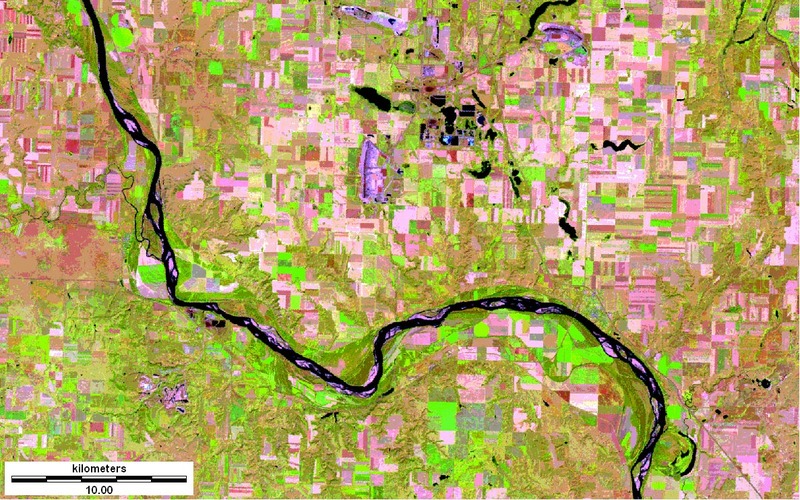 Active vegetation is green and yellow green, bare ground and fallow fields are pink and red, water bodies are black. 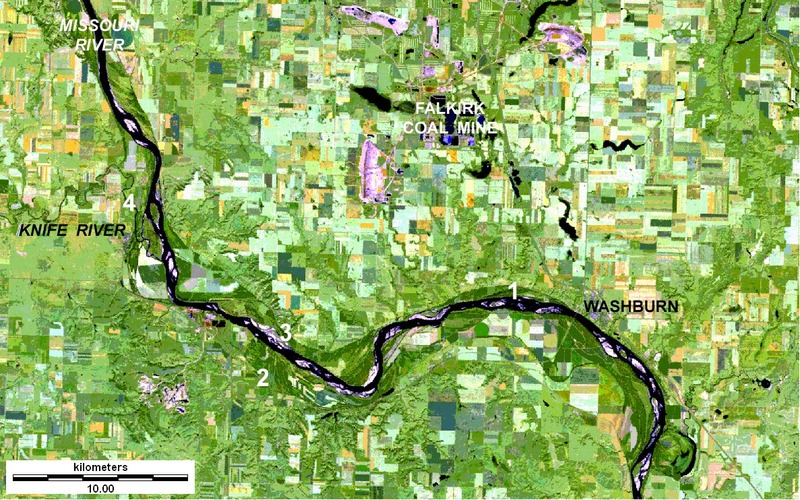 The Falkirk Coal Mine appears as three purple patches in upper center of scene; another smaller coal mine is located in the southwesten corner of the scene. At the time of Lewis and Clark's visit the Mandan and Hidatsa Indian villages were the focus of a trading network that encompassed a vast region between the Great Lakes and northern Rocky Mountains. Rich bottomland soil sustained agriculture (corn, beans, squash and sunflowers), and the adjacent uplands teamed with buffalo herds. Hidatsa and Mandan Indians traded their agricultural produce along with Knife River Flint, which was collected from local gravel deposits. This flint was highly prized for making stone tools across North America. Distant view of the Mandan village beside the Knife River. The village was situated on a terrace that stood above flood level. George Catlin, 1832, oil. Hidatsa village on the Knife River. 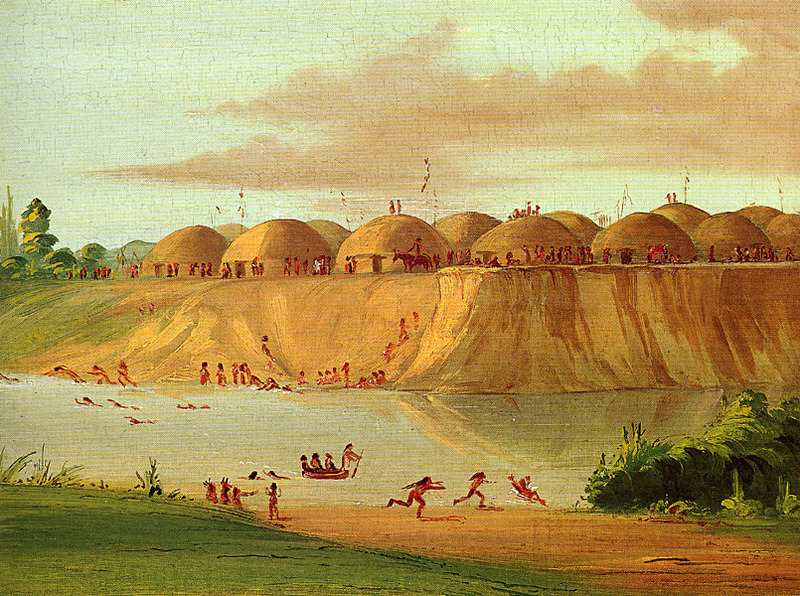 Earth lodges were the summer dwellings for Hidatsa and Mandan peoples. Bull-boats made of buffalo hide were used to cross the river. George Catlin, 1832, oil. Bird's-eye view of the Mandan village. Notice the arrangement of earth lodges around the village center, which is marked by a barrel-shaped object known as the "Big Canoe." George Catlin, 1837-39, oil. Local Indians served as middlemen in a far-flung trading regime that included copper from the Great Lakes, Catlinite (pipestone) from Minnesota, obsidian from Yellowstone, and Dentalium shells from the Pacific coast. With the arrival of European traders in the 18th century, new items entered the trading network: furs, guns, and metal. 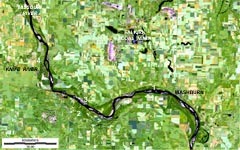 Closeup view of Knife River Indian Villages vicinity. 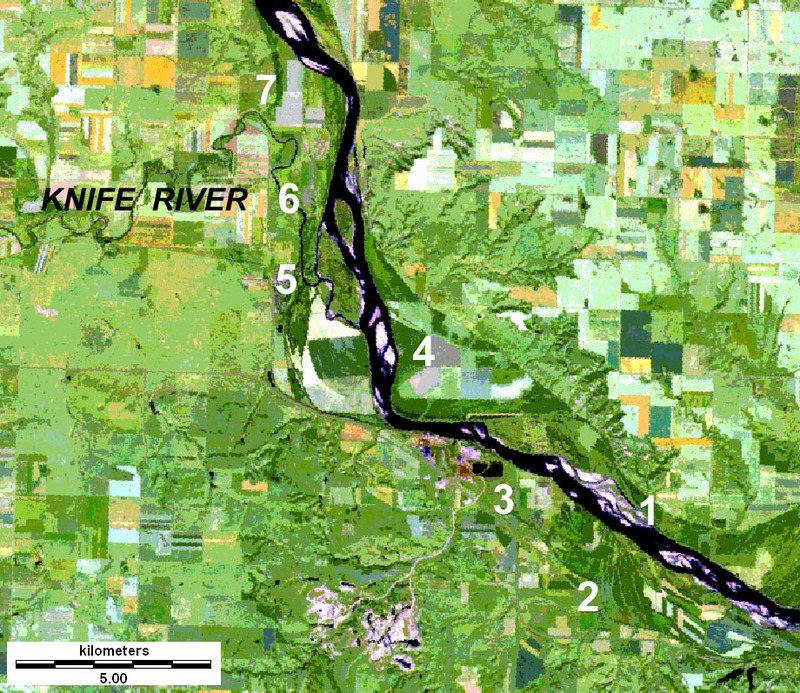 Notice the broad valley at the junction of the Knife and Missouri rivers. Both rivers have flooded repeatedly and meandered back and forth across the valley, leading to great changes within the valley system during the past two centuries. Today much of the upland area is utilized for agriculture (rectangular fields). 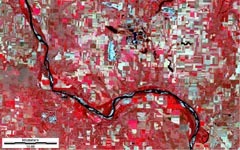 Landsat TM 257 special false-color composite, 15 Sept. 2000. 1 - approximate location of original Fort Mandan, 2 - Fort Clark State Historical Site, 3 - Mandan village (Matootonha, Sheheke), 4 - Mandan village (Rooptahee, Black Cat), 5 - Awaxawi Hidatsa village (Mahawha, Tatuckcopinreha), 6 - Awatixa Hidatsa village (Metaharta, Black Moccasin), 7 - Big Hidatsa village (Menetarra, Le Borgne). 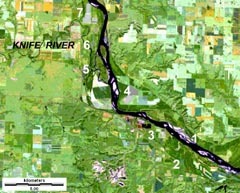 Knife River Indian Villages NHS includes sites 6 and 7. Based largely on Ronda (1984, p. 68). Kite aerial photographs of the Knife River Indian Villages NHS clearly depict remnants of earth lodges, which are revealed by shadows and distinctive vegetation. The remains of hundreds of earth lodges are preserved as circular depressions, each about 30 to 40 feet in diameter. The earth lodges are still quite distinct in spite of former agricultural land use at the site. Depressions mark the former interior floors of lodges, which were built at ground level (not dug out). Surrounding each depression is a raised rim composed of material that fell off the lodge wall and roof. Some portions of the site are mowed, so the lodge remains can be seen easily on the ground. Other portions are covered by prairie grass, shrubs and woods. Earth lodges in these unmowed portions are not obvious from the ground, but are quite evident from above because of variations in vegetation cover. Problems of site management include river erosion, which has removed portions of some villages, and burrowing animals. Gophers and ground squirrels bring up artifacts, which visitors are tempted to carry away. 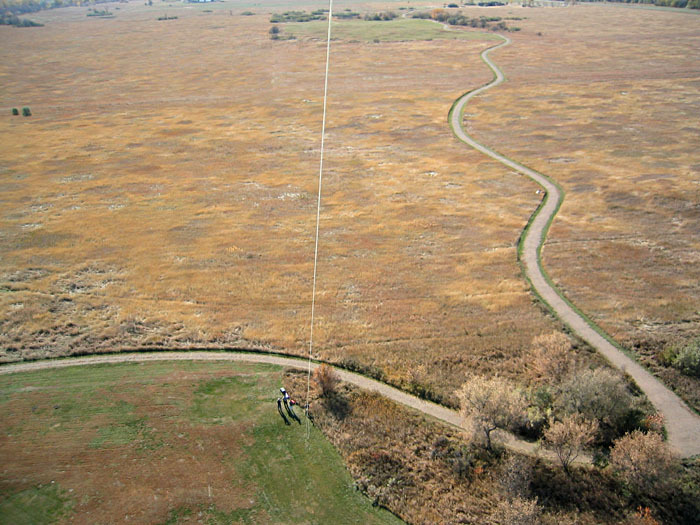 Both these conditions are depicted in the kite aerial photos taken in early autumn (Oct. 2003). 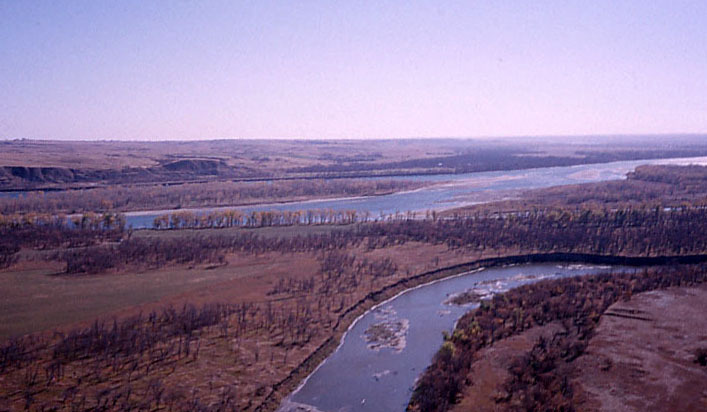 View toward the southeast with Knife River in the foreground and Missouri River in the background. Knife River Indian Village NHS is in near portion of the scene. View northward along the Knife River. Part of the Awatixa Village site on near left side of scene. View southward over the Awatixa Village site. Mowed portions in foreground and background. 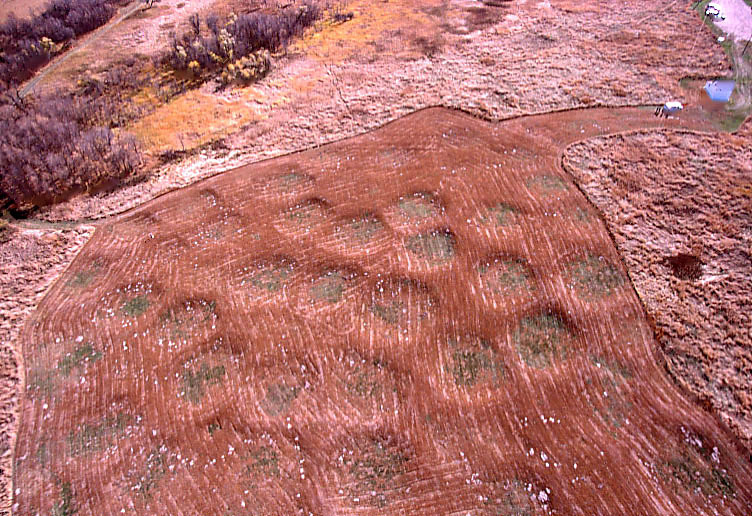 Circular vegetation patterns indicate many dozens of earth-lodge remains in the unmowed middle portion. Vertical shot of earth lodge remains at Awatixa Village. Green circles, about 30 feet across, mark floors of former lodges. 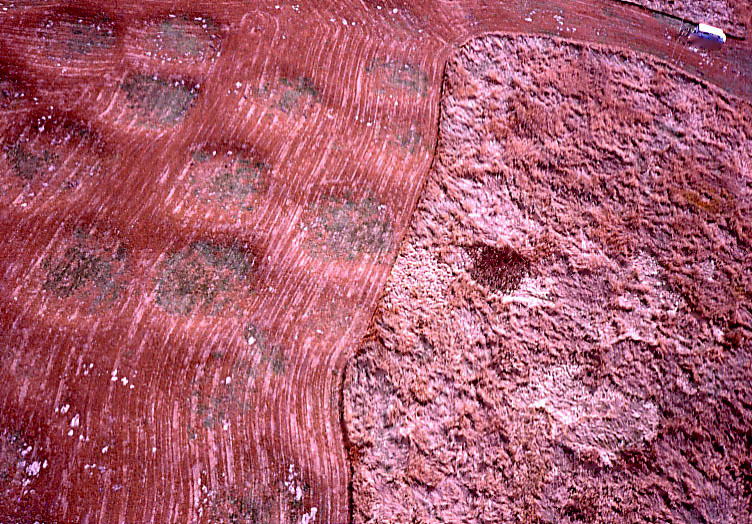 A distinctive mowing pattern crosses the lodge remains, and small white patches are animal burrows (gophers and squirrels). Erosion by the Knife River (lower right) has removed part of this village site. Superwide-angle view of the Big Hidatsa Village site showing several dozen earth-lodge remains in the mowed portion. Kite flyers are standing in upper right corner of the scene. Oblique view of mowed (left) and unmowed (right) portions of the Big Hidatsa Village. The small, light patches in the mowed section are burrows made by gophers and squirrels. Kite flyers are standing in upper right corner of the scene. 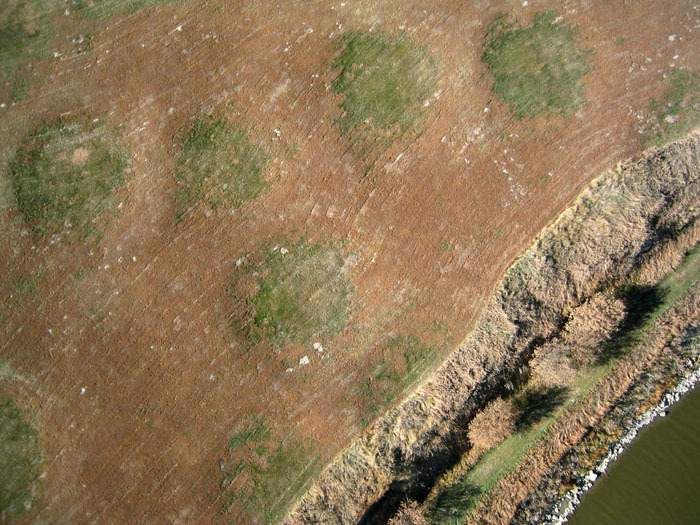 Closeup, vertical shot of mowed and unmowed portions of the Big Hidatsa Village site. Earth-lodge remnants are depicted clearly in both portions. Northeastward view over unmowed portion of Big Hidatsa Village with Missouri River in the background. 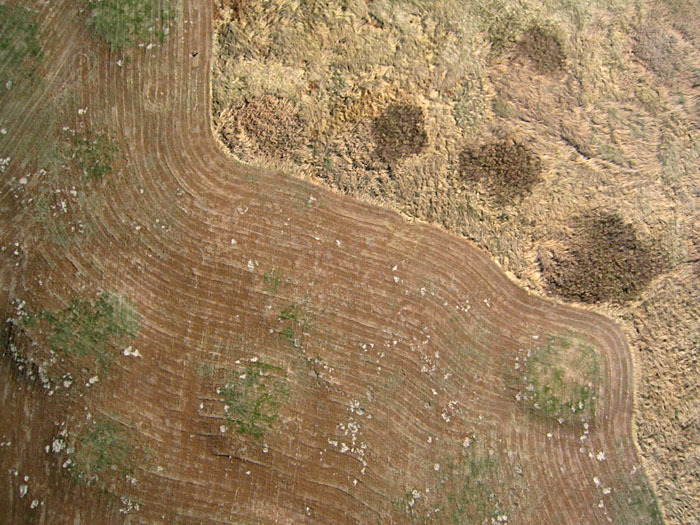 Former earth lodges are revealed by vegetation patterns. 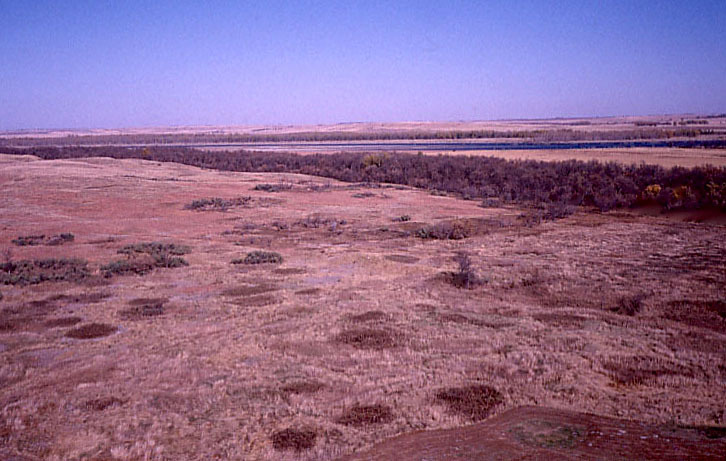 Brushy growth fills circular depressions in the prairie landscape. permission to conduct kite aerial photography. Knife River Indian Villages National Historical Site--see KNRI NHS. Mandan Village--A distant view, by George Catlin (1861/69) from the National Art Gallery. 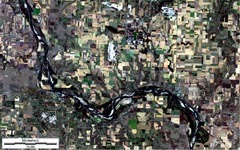 Views of the Missouri and Knife rivers from the U.S. Geological Survey. Knife River Indian Villages from Trails and Grasslands. 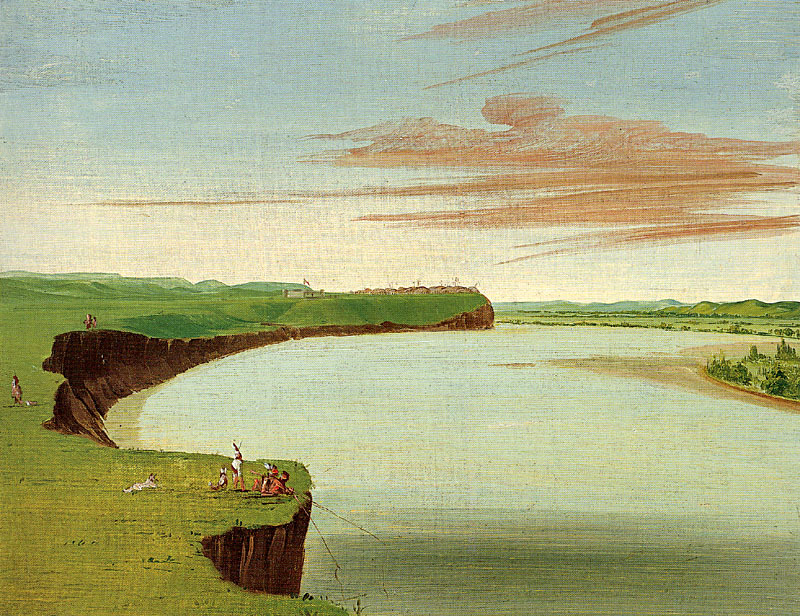 Lewis and Clark in North Dakota from North Dakota Geological Survey.